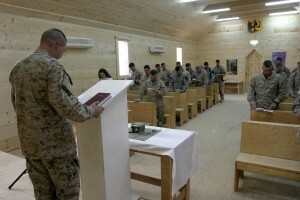 WASHINGTON — The U.S. House of Representatives approved an amendment this week that reinforces the military’s current ban on atheist chaplains. The amendment, which passed 23 to 173, was attached to the 2014 Department of Defense Appropriations Bill, and was introduced by Louisiana Senator John Fleming. He noted that the role of chaplain is historical and was established with a religious purpose. However, the Times-Picayune reports that some legislators disagreed with Fleming. “It is wrong to say to a solider who comes from [an atheist] tradition, that he or she, if they have an issue on which they’re troubled, must go to a mental health professional in order to receive counseling, rather than someone who comes from their philosophical faith or tradition,” stated Representative Rob Andrews, D-NJ. The vote comes at a time when 38-year-old Jason Heap is making headlines for his pursuit of becoming an atheist chaplain in the United States Navy. As previously reported, Heap asserts that because he is endorsed by the Humanist Society, he should be offered the chaplain position. However, the Navy does not recognize the Humanist Society as an endorsing agent. In order to be accepted as a Navy chaplain, all applicants must receive endorsements from religious organizations approved by the military. According to the Department of Defense website, this list of “ecclesiastical endorsing agents” includes representatives from over 200 different denominations and organizations. Although the majority of agents would be considered Christian, several other religions are included, such as Islam, Buddhism, Judaism and Unitarianism. Fleming contends that the demand for atheist counsel is very small. The amendment must now be considered in the Senate, and a vote could take place at any time.